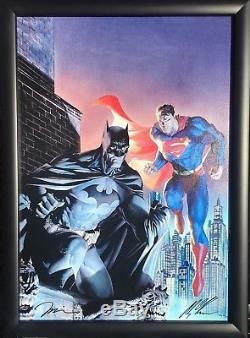 LEGENDARY HEROES giclee on fine art CANVAS by JIM LEE and ALEX ROSS. Image Size 25 x 19. 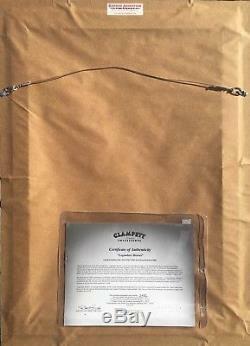 Frame Size 29.5 x 21. This piece is now quite difficult to find. It was produced as a limited edition of only 250 units worldwide. 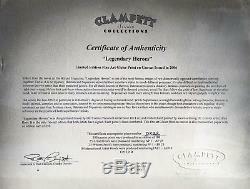 This piece comes with its Certificate of Authenticity issued from Clampett Studio Collections. Legendary Heroes is a collaborative effort between award-winning comic book artists, Alex Ross and Jim Lee. It is SIGNED and NUMBERED in PENCIL by BOTH masters. Lee created the drawing and Ross rendered the image into a final painting. 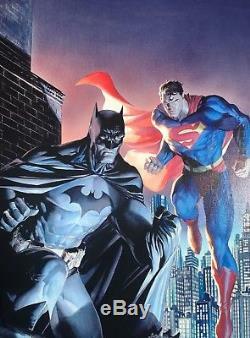 Alex Ross style is seen through the human like poses and features of both superheroes, while Lees style promotes muscular aspects of Batman and Superman. Alex Ross is one of the most renowned and collected comic book artists in the world. His creative images have appeared in Marvel and DC Comics as well as the art world in general. Ross is highly regarded for bringing a sense of humanity to todays superhero. Jim Lee is recognized as one of the single important forces behind comics today. Comic book heroes illustrated by Lee utilize great amounts of physical size that is further enhanced with strong and emotionally-determined facial expressions. 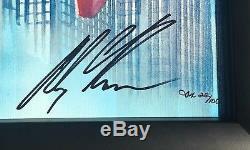 The item "JIM LEE ALEX ROSS LEGENDARY HEROES giclee Canvas 2x SIGNED SN LE FRAMED COA" is in sale since Saturday, December 30, 2017. This item is in the category "Collectibles\Comics\Original Comic Art\Other Original Comic Art". The seller is "apieceoftimecollectibles" and is located in Novato, California. This item can be shipped to United States, Canada, United Kingdom, Denmark, Romania, Slovakia, Bulgaria, Czech republic, Finland, Hungary, Latvia, Lithuania, Malta, Estonia, Australia, Greece, Portugal, Cyprus, Slovenia, Japan, China, Sweden, South Korea, Indonesia, South africa, Thailand, Belgium, France, Hong Kong, Ireland, Netherlands, Poland, Spain, Italy, Germany, Austria, Israel, Mexico, New Zealand, Singapore, Switzerland, Norway, Saudi arabia, United arab emirates, Qatar, Kuwait, Bahrain, Croatia, Malaysia, Brazil, Colombia, Panama, Jamaica, Taiwan, Chile, Costa rica, Trinidad and tobago, Guatemala, Honduras.